In 1989 this lovely lady was born! Not the bike, the lady! 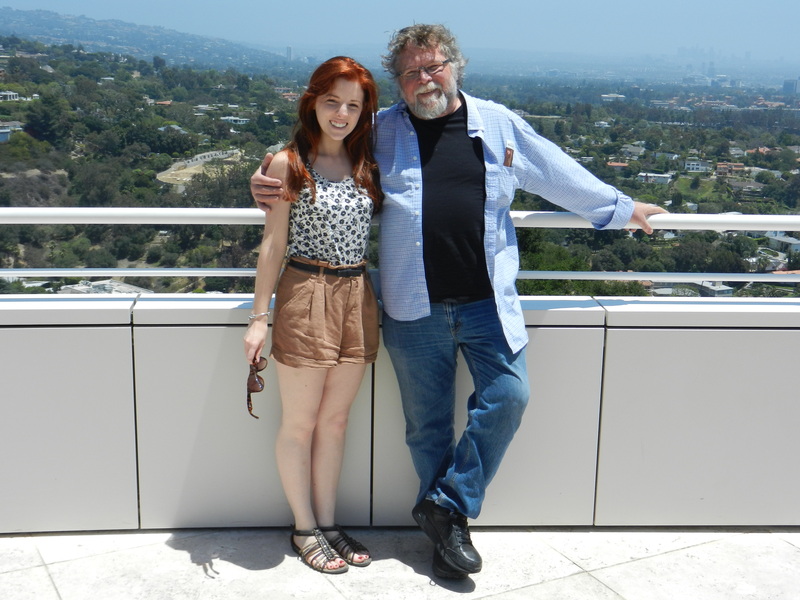 It’s my daughter Hannah and she has been wonderful, joyful, and amazing her whole life. Prior to her being born I had ridden motorcycles for years. A Kawasaki here, Honda there, until 1978 when I came upon a BMW R60/5! Wow, it was a beautiful bike. I struggled to come up with $1800 to purchase her, but did so. We worked well together for 11 years, through many girlfriends and many trips. For my own safety, I won’t list the girlfriend’s names, just the states: Georgia, Louisiana, Alabama, South Carolina, Mississippi, Florida, Kansas, Pennsylvania, Minnesota, North Dakota and Wisconsin . In 1989, my then wife, who had enjoyed many a ride on the back, suggested that a dad-to-be really shouldn’t be riding a motorcycle. And, that we could better use the money to fix up the baby’s room. Unfortunately, it all made sense to me and in a short while the bike was sold and Hannah was born. No question that it was a good trade off, though overall maintenance on the BMW over the years would have been far less costly. Hannah was born in 1989 and it wasn’t until all the kids were grown and away, in 2012, that I bought another motorcycle. This one was Big Red: 2004 Harley Road King Classic; unequivocally, (I whisper so the BMW won’t hear) the best motorcycle I have ever ridden. A brief comparison. The BMW weighed 463 pounds and the Harley weighs 731 pounds. The engine on the BMW was 600cc whereas the Harley, before the Screaming Eagle upgrades, was 1400 cc, an engine more than twice as powerful. But despite the Harley’s prodigious ability, awesome sound, feel and dependability, I still had a hankering for those halcyon days of riding and the bike that got away, the BMW. So I was thrilled a short while ago to find on EBAY a BMW R60/5 from the old days. With luck and last minute bidding, I got it: a 1973 BMW R60/5! That’s her in the picture. Not the girl the other one. So what can I say? Okay, okay, it was absolutely a good deal years ago to swap the early BMW for Hannah. I know that. 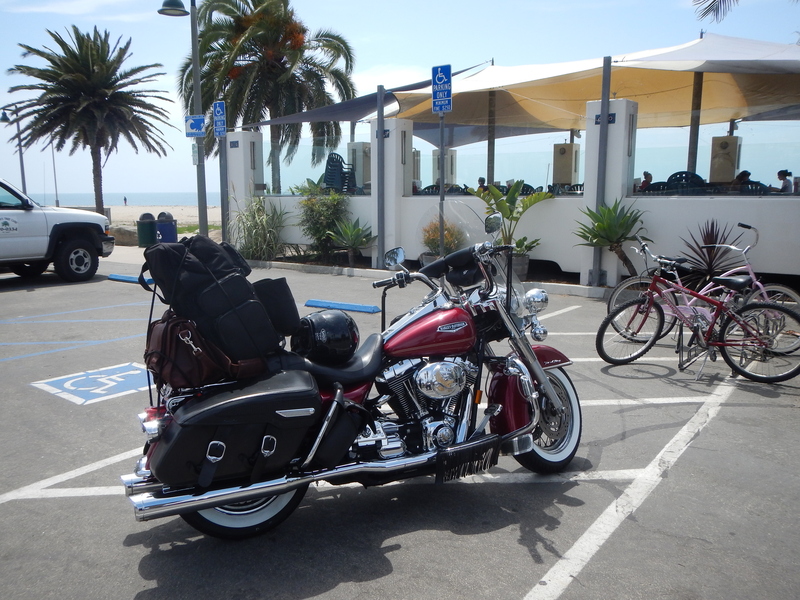 The Harley has been an incredible workhorse, recently taking me across America and back. Easily the most powerful, comfortable and beautiful bike I’ve ever owned. The 1973 BMW is 40 years old, has a kick starter (and an electric starter), starts immediately, but smokes heavily (only just for a moment when it starts) out of the right exhaust. Sometimes it leaks gas onto my boot. It’s slower, but because it’s so balanced (flat twin opposed cylinders) it’s incredibly nimble through all the twists and turns. The Harley is like a flexible tank. The BMW is smooth, quiet, fun and maneuvers more like a bicycle. But hey, it’s not a competition! I rode the Harley the 55 miles up to Dalton today and back. It cruised easily on the interstate at somewhere near the legal speed. That’s what she’s for: grinding up the big miles on the big roads. Tonight I took the BMW into town, slalomed easily on roads around the levee, over the river, and did an easy u-turn on Broad street so I could get to hear the timeless jazz at 333. All so smooth. Now I need to call Hannah and make sure she knows I love her. Last July I moved over here from Ireland. The kids had grown and my marriage had fallen apart. So after some painful reflection I decided to go home. I squeezed 16 years of my possessions and memories into four suitcases and said “goodbye” to a beautiful country and great friends. When I arrived back in Georgia, Jeff loaned me his Harley, Big Red, and eventually, reluctantly, he sold it to me. They are still on good terms. I promise. He can ride her whenever he wants to. I had a tough time adjusting when I first got here. New land, new people, mixing with old memories, reflections and dreams. The dreams were the worst bit. I’d wake up feeling vanquished and shipwrecked, tossed onto an unfamiliar shore. I went through a period of mourning, which Freud says is love’s rebellion against loss. He was right. I viscerally lived out all the various meanings of the word: bereft. What has helped me survive and prosper has been my family, the incredibly hospitable folks of Rome, messages from friends in Ireland, God, prayer, and, of course Big Red. They all gave me hope and encouragement. I’m not there yet; I still have quite a few miles to go. Big Red especially helped me stay in the “here and now”, practice my mindfulness and distracted me away from painful memories. All those miles, the long cross country trip, gave me time for peacefulness, silent reflection, centering, letting go of the past, prayer, forgiving, gratitude, redemption and for hope to spring anew. Prayer comes easily on a motorcycle, especially a Harley. Hope, for Emily Dickinson might be “a thing with feathers” but for me hope comes on two wheels, barreling down open and unknown roads, where sometimes you can see only as far as your headlight shows you. And that’s good enough for me. Thanks everyone and thanks Big Red. It was great to meet up with my buddy Jeff today at our usual café, Wes Mans, in White Georgia. We hadn’t seen each other since our cross country trip. I cranked Big Red up and took off down Highway 411. It was great to get on the bike and head out. The winds, the scents, the sounds, the dangers all help bring me into the present, the here and now. I needed this ride. It had been a rough few weeks. 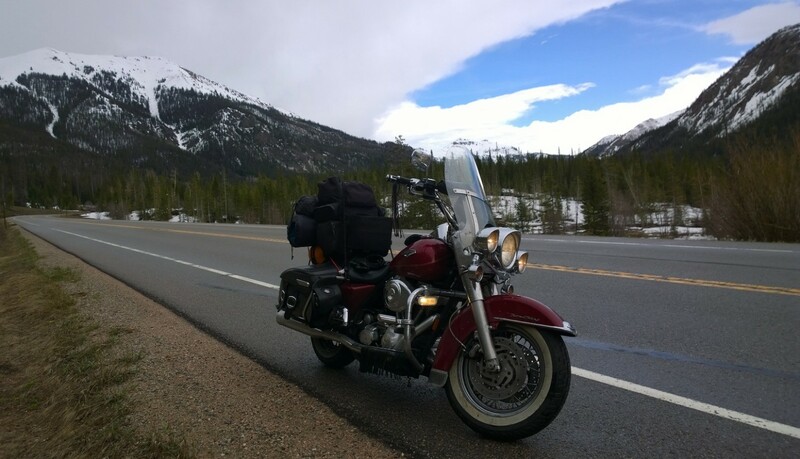 When I got out on the open highway I thanked the good Lord for this day, for this ride, and confessed all my trials and trespasses of the past week. It got me thinking about the Lord’s Prayer and the bit about forgiving us as we forgive others. Depending on your interpretation we’re praying for forgiveness of debts or trespasses. Forgiveness for debts is pretty easy to understand; though it’s amazing how many of us can utter this while we pursue our debtors! Trespasses is harder but more fruitful to explore. Essentially, it’s our sins; the times we trespassed, trampled without sacred reverence, even if only inadvertently, on the holy lives of friends and lovers. So I got all of this out, asked for forgiveness and traveling mercies and found absolution in the wistful but healing winds and through the winsome, winding roads. Roads are always in the present, always welcoming, offer new hopes and bear no grudges. Jeff showed up in his ominous looking police interceptor. We both had country fried steak and stories to tell. 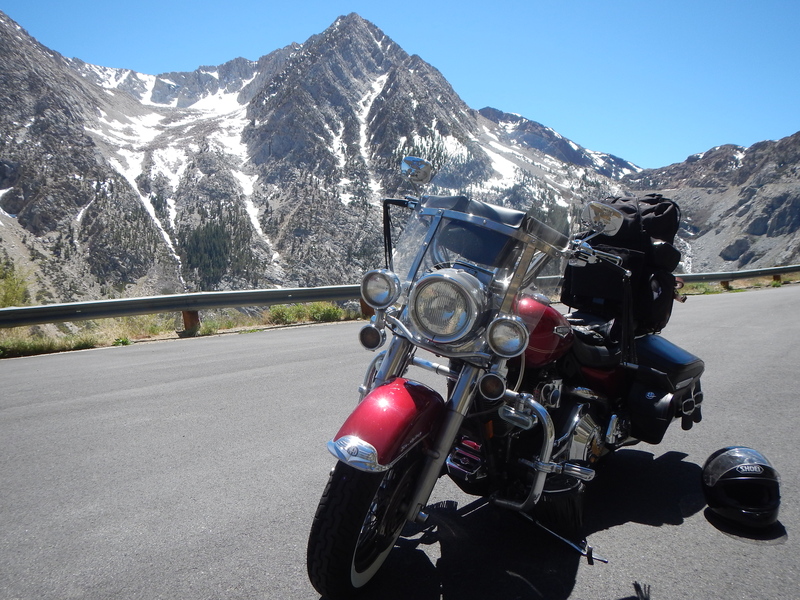 We reminisced about the ride, about Yosemite, Death Valley, and the Pacific Coast Highway, places that felt magical and those that were frightening. Jeff wants to take another trip; this time up to the Blue Ridge Parkway. Spend a couple of days cruising around the Great Smoky Mountains, Cherokee and Shenandoah. Just the sounds and intimations of the place names made me want to leave right then and there. We made plans to look at dates and locations and get back to each other. It was a great lunch; the steak wasn’t healthy but the conversation was healing, holy. Then I rode home, driving on unfamiliar roads, purposely getting lost and found, the way life is.